Temporomandibular joint disorders (known as TMJ disorders or TMD) are the most common condition affecting the jaw joint. TMD is also known as facial arthromyalgia, and literally means face, joint and muscle pain. It is described as a dull ache with occasional sharp episodes affecting the jaw joint and muscles. Discomfort is often felt in front of the ear and in the muscles surrounding the angle of the mandible and up to the temple. Sufferers may also notice clicking in the joint, difficulty opening the mouth, reduced jaw movement and a blocked feeling in the ears. It can occasionally occur in childhood but is more common in the 20s and 30s age group. In many people, TMD settles down spontaneously. When mild, the best solution is to ignore the clicking and occasional tenderness in the joint – although it is an annoyance, it does not require treatment. In others, pain comes and goes and is worse during or following a time of distress. Sometimes a constant discomfort develops which interferes with daily life and can make the sufferer feel miserable or depressed. This type of disorder requires assessment and treatment if possible. For a sudden onset of pain the advice is to rest the jaw, eat only soft food, apply warm/cold compresses to the area or gently massage the affected side and take simple analgesics. Be aware that the discomfort is made worse by stress. Try to relax more and sleep comfortably to ensure a restful night's sleep. 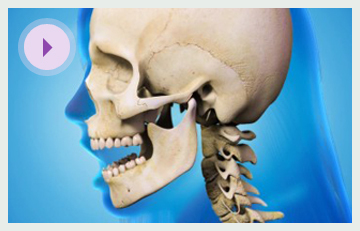 If the jaw remains uncomfortable, several treatment options are available. A dentist will often provide a bite guard or plastic appliance to cover the teeth and this is generally to be worn at night. This may resolve the problem by helping to avoid clenching or grinding the teeth. If symptoms persist, referral to a hospital may be indicated to assess the cause of this more debilitating issue. Treatment might include: medication; learning relaxation, stress management and coping techniques; or, very occasionally, minor surgery to the joint.